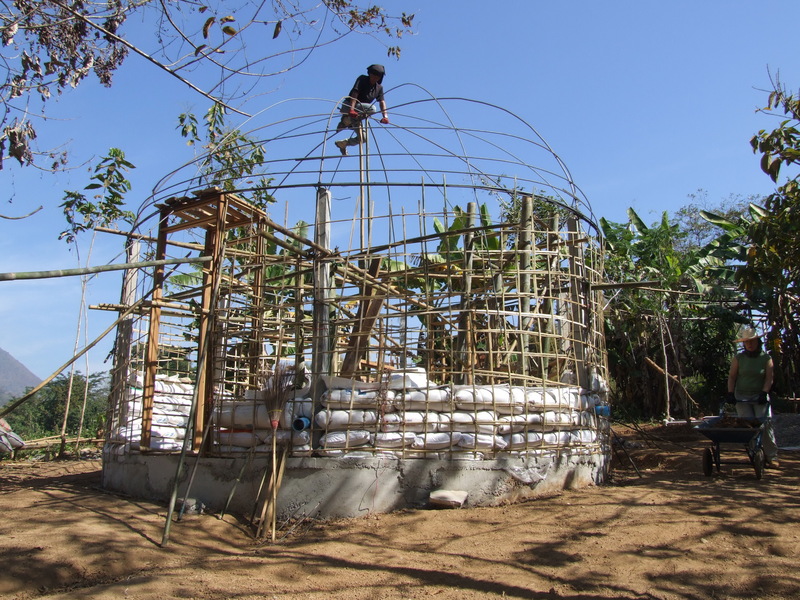 The two biggest challenges for building with natural materials here in Thailand are termites and the monsoon. To tackle the termite problem, I consulted my natural building books, got on to Google, and talked to a great many knowledgeable people, including Paulina Wojciechowska (Earth Hands and Houses). Finally I made the decision to build on a concrete base. 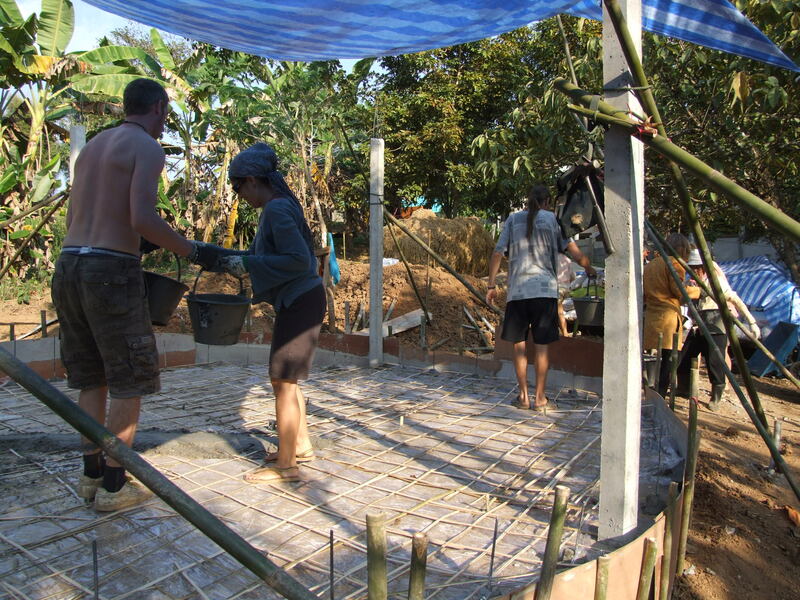 A trellis of bamboo makes a strong foundation on which to pour the concrete. We needed something to attach the bags of rice husks to. 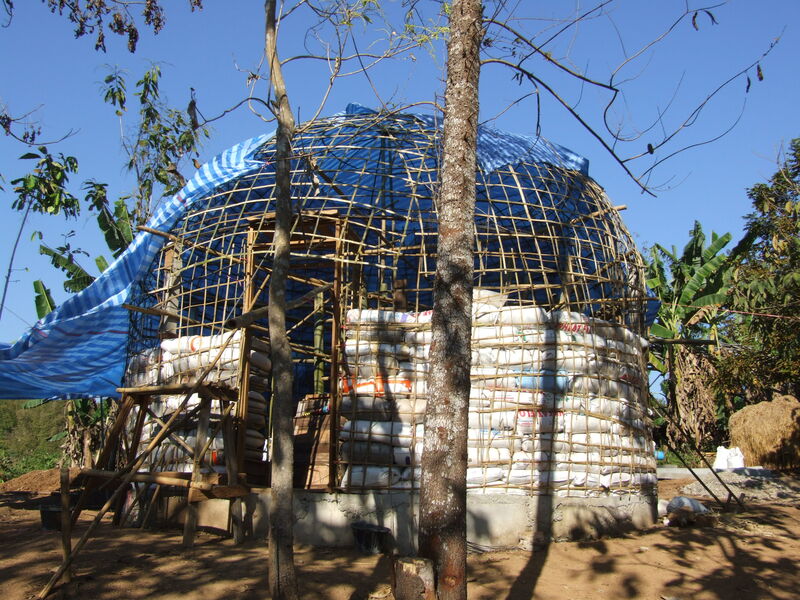 Unlike earthbags which are heavy and do not need a frame, rice-husk-bags are light weight and a stack of them one on top of the other would tumble down should you mistake them for earthbags and lean against them. But they would be soft to fall on. We built a frame using thin steel bars. Finding the exact shape for the dome roof was interesting. We used a long thin bamboo pole and there was a lot of ‘down a bit’ ‘up a bit’ until it felt right. 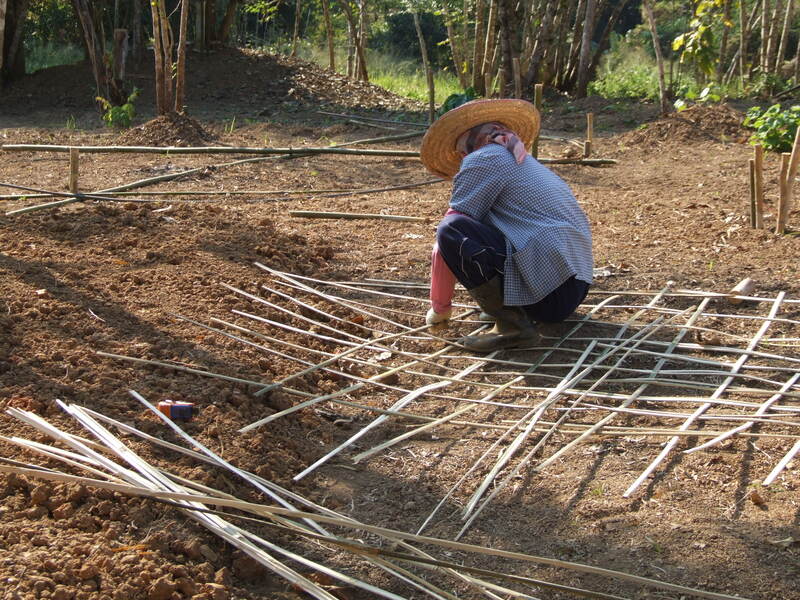 Then we covered the whole dome with a bamboo trellis. The ‘bird cage’ was ready for the bags. Then the first layer of bags was set on to the concrete base. We had stuck some pieces of steel bar up from the concrete floor so that the first bags could be lowered on to them and secured into position. 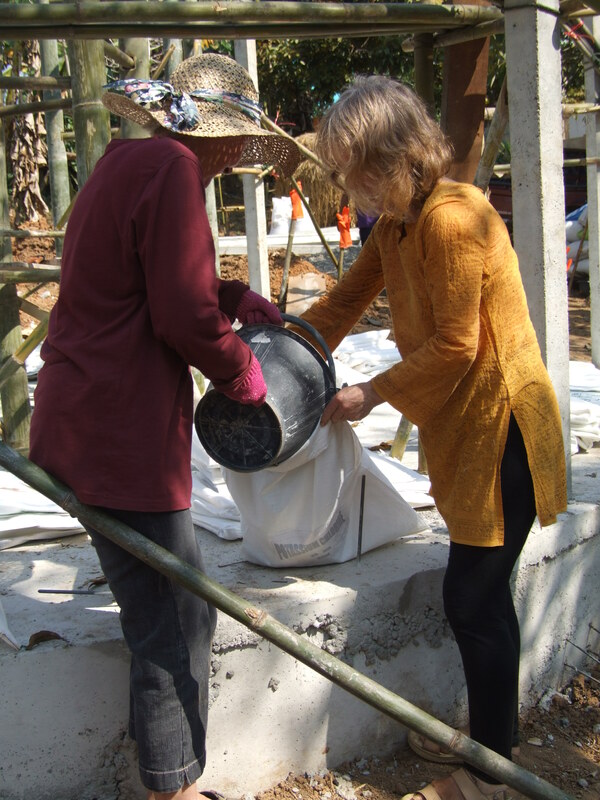 Sally Francis was luckily on site volunteering at this stage, and with her experience of earthbag building she was able to advise us. The first layer of bags was filled with gravel, and the second with sand. This is to prevent any moisture leaching up from the ground through the concrete. Or if there was a massive monsoon deluge, the water could theoretically course through the building and out the other side. Filling the first layer of bags with gravel. That’s me in the hat. Rice-husk-bags followed, one on top of the other up the sides, each tied securely to the trellis with string made of hemp. Rice-husk-bags tied securely to the trellis. 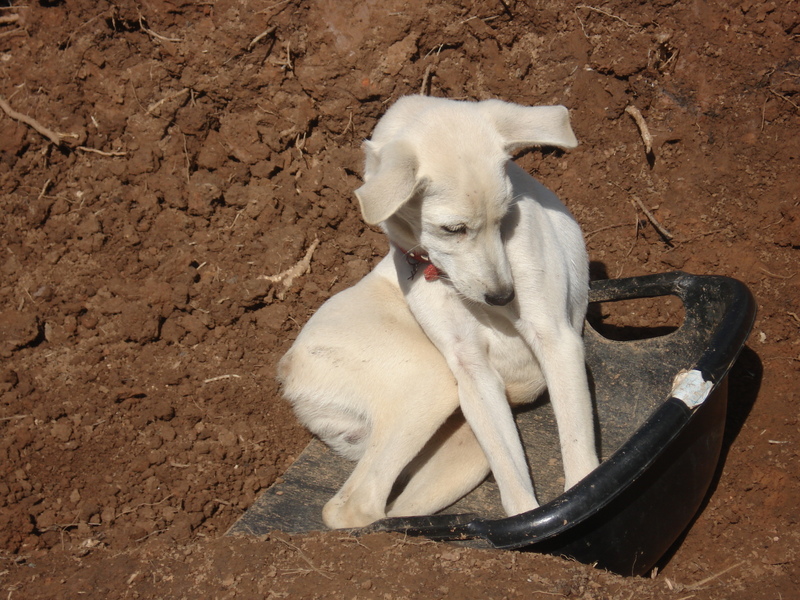 And finally, a picture of Toni in a ‘bucket’ thingy that is used for carrying earth.